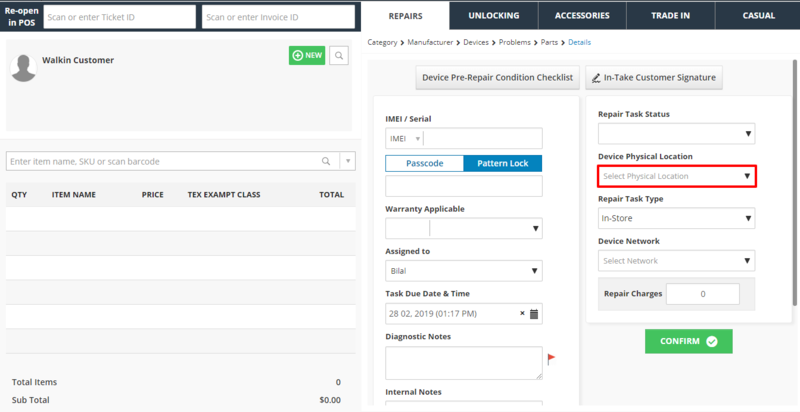 You can easily add the location of the device with RepairDesk. This will enable you to know where the device pertaining to a certain ticket has been placed. Go to Manufacturer > Devices > Problems > Parts > Details while generating the ticket. There under the Device Location select available locations. If a location isn't available, simply enter the device location and click Add New. Go to Repairs > Manage Tickets. Check the corresponding ticket and click Action and then View from the drop down menu. Then in the Device Details section, click Action and then Pre/Post Conditions & Comments. A screen will appear with pre-repair tab. Here you can view/ edit the device location.